Syzygium myrtifolium (Roxb.) Walp. 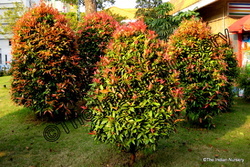 or commonly known as Lilly Pilly is very attractive plants for used in creating colourful topiary. The Indian Nursery imported and cultivated this plants in order to supply to various beautiful landscape projects in India and abroad. With enriched market experience, we have been able to offer a wide spectrum of Foliage Flowering Plant. We are providing the first-class series of Dracaena Golden Milky Plant. These are made by professional’s team who has prosperous industry experience and practice. This erect plant features cream, golden, and green foliage. It can be grown in fancy indoor pots or potted in corridors and living room corners. Fresh to look at, these Rhoeo Plants are true synonym of beauty and available in a plethora of charming colors and sizes to choose from. These Rhoeo Plants are excellent to create a magical surroundings in any place. We have specialized ourselves in the production of wide collection of Foliage Plants that are cultivated under the utmost care of professionals. Our range gives a unique value to your indoor by enhancing its beauty many times. as we all know foliages are one of the most essential part of fresh flower business, as without them any bouquet or decoration is incomplete. We are manufacturing various types of foliages that resemble nature in all its magnificence. The F1 hybrid seeds of Antirrhinum, Geranium, Impatiens, Nicotiana, Petunia and Ornamental Chilli produced in climate-controlled greenhouses under close supervision of specialists are marketed both within the country and abroad. We offer a variety of Foliage Plants to the clients, that are nurtured with care in our nurseries. 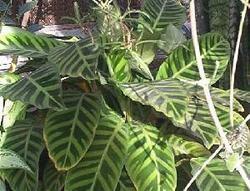 The Foliage Plants are cultivated in hygienic conditions under the utmost care of the gardeners. Our range of Foliage Plants gives a unique value to the indoor space by enhancing its beauty many times.